We’ve talked a little bit about American express here on Milenomics before. We’ve called Membership rewards, Shadow Currency, Orphan Saviors and Risky Business. American Express is well known for their customer service, and that extends into the deals they offer cardholders, sometimes referred to as “American Express Offers” or sometimes they are called Sync Deals. Using Amex Deals effectively can easily result in hundreds of dollars in profit for you each year. Today we’ll talk about how to increase the amount of cash and miles you can earn by adding Authorized User cards, and also go over tips to allow adding American express offers to multiple Authorized User Cards. That said, be creative in your AU accounts. Does your wife have a maiden name? Apply for a card in that name as well as in her married name. Adding a family member who is trying to build new credit (and keeping the AU card for yourself) can be a win-win situation. You receive another Amex card, and he/she gets the benefit of your credit history/utilization. One great thing about American Express Authorized users is that they receive not just a personalized card, but a unique card number. This means that any deal American express is extending as “One per card” can be leveraged using Authorized User cards. Chase and Citi usually just send a card with the same card number and a different name, which is less useful for one time only deals. 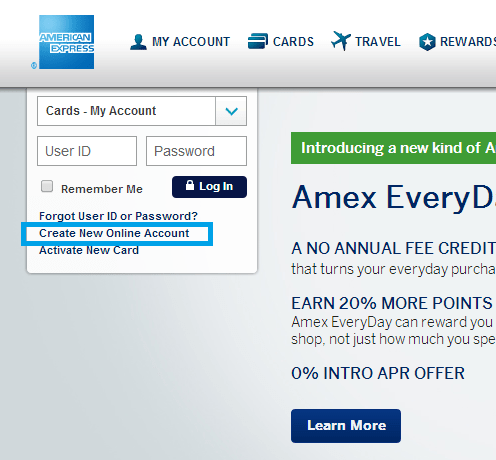 To me the largest hurdle to navigating the Amex Offers programs are that there isn’t one single way to handle offers. Sometimes an offer can be added via Social media; by Tweeting to Sync or by Syncing a deal on your Facebook Page. Adding offers Via Twitter and Facebook can be tedious for multiple cards–only one one card can be added to each Facebook/Twitter account. 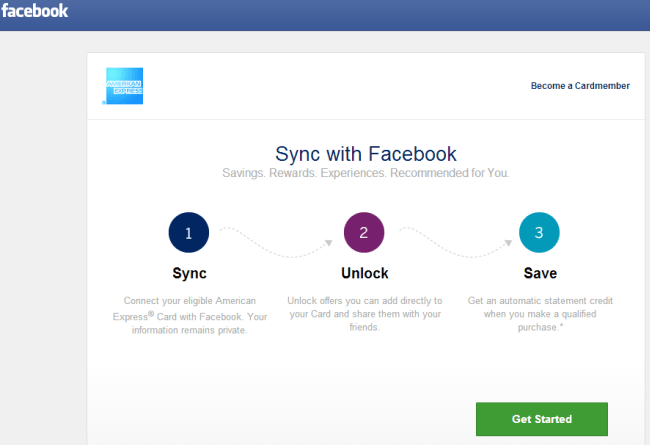 You’ll need to create multiple Amex-Specific Facebook and Twitter accounts if you want to access deals on all of your cards. A good trick to doing so is the Gmail Dot Trick. You can add a dot to your email addres (or many dots), and all the mail will be delivered to your main address. Notice I’ve opened three tabs. In each tab Select one of your cards. The first tab (shown above) has my Gold PRG selected, tab #2 has my BCE, and Tab #3 my other BCE. As long as you open these tabs before you add an offer you’ll be able to add the same offer to all your cards. Some offers are card specific, so if you don’t see the offer on one card it probably hasn’t been extended to you. Using the above multiple tab technique you’ll be able to load 3x-4x the offers and take a great deal and make even more money off of it. But what about our Authorized user cards? Are those cards left out in the cold? From here you’ll register just like you are creating a new account. One specific AU card will be registered to each account you create. Once you’ve registered take note of the new account login, as you’ll use it for the AU card to add future offers. Tip: Create a base login for each person, say SSimon, and then add the last 4 digits of the card number. SSimon1013 would be my Amex ending in 1013 NSimon1004 would be my wife’s card ending in 1004, etc. You don’t have to use names and initials, anything you can easily remember will work. As you can see below, I’ve created a login for my SPG card, of which I’m an AU from my Wife’s main SPG Amex. Any Offer which shows up for her will show up here for me. What’s great about this setup is that even if she clicks on an offer it will not disappear from my card, since I’m a totally separate login. 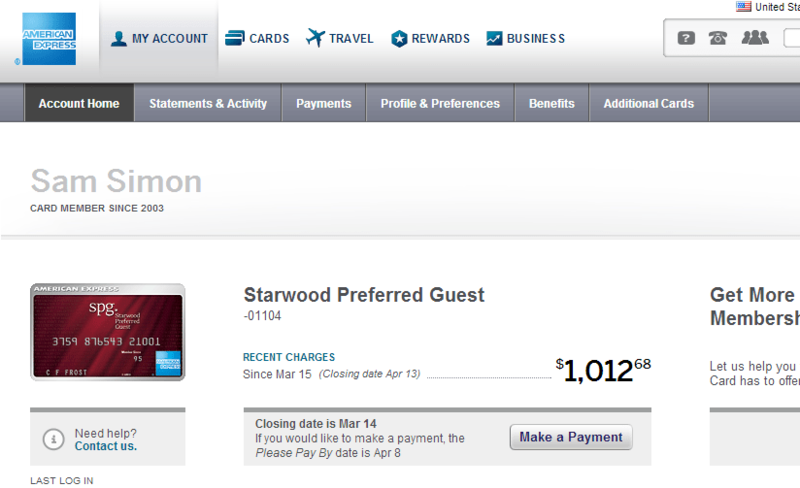 Notice this login only shows one card, the SPG Amex I am an AU on. This is a separate account as far as Amex is concerned. Interestingly enough the card member date follows my main account date. I don’t recommend using these AU accounts for making payments, checking statement,s or anything besides adding offers. The functionality of them just seems a little off to me. They often show you an incomplete picture of your card usage, and don’t reflect the main account’s balance. I’m not sure what Amex’s end goal is for these AU accounts, but for now take the Money and Run. There are probably some deals you could use to compliment your daily spending habits. For me Amex Offers are all about the gift cards. Any high dollar offer, like the $50 off $250 at Bloomingdale’s offer Michelle wrote about is a great way to earn some cash and miles. Whenever there’s a high dollar offer at a retailer I check the resale value of gift cards, buy a high dollar Gift card and then sell it to a gift card resale site. I was lucky enough to find the Bloomingdale’s offer on 5 of my cards, and bought and sold the gift cards at a nice profit. Last Winter’s $50 off of $250 at Best Buy was an easy $25+ moneymaker on each card you could load the deal to. Keep an eye on these Amex deals, and use them as an introduction to gift card sales. Think of the Amex Discount as a safety net–you can learn the mechanics of gift card sales without worrying about losing money on a bad deal. Check the math before you do these purchases–but most of the bigger 20%+ off deals can turn into money makers. When you add AU cards and Sync to all of the cards using the above tricks you can increase the money made by 5x-10x. The Miles/Cash Back you earn for the initial purchase are the gravy on top! – Written by Sam Simon. All ideas are my own, but I encourage you to see my point of view and I promise I’ll try to do the same. Connect with me on Twitter @Milenomics. Liked it? Take a second to support Sam Simon on Patreon! In general, when an authorized user spends money on a credit card, do you earn miles or points for that spending? Brandon: all AU spending earns miles. Great, informative post and I read a lot of blogs but haven’t seen this topic outlined like this! Quick question — you mentioned that you have about 10 amex cards but I thought the limit was four per person. I have three amex and am agonizing over which to make my “last”. Or do I not have to worry and can have more than four? BTW I have excellent credit above 800. Thanks for any help you can provide. I believe the offer you’re disclosing actually mentions in the T&C’s that it is limited to one offer per online account. Have you had success with the above with the bloomie offer? nm, please disregard my last comment. What is the “multiple tab trick?” Is this just something for the primary account holder, or can authorized users do this also? Nancy: The multiple tab trick is outlined in the post; click and open a new tab for each of your Amex cards, and navigate to one card per tab. this allows you to add the offer on multiple cards tied to a single login. This trick is not needed for AU cards–instead you can just create a new login for those cards and add the offers there. The exception to this is if your AU have multiple cards then they would use the multiple tab trick as well. Nice tip about AU cards. But even with Roboform, having multiple logins is royal PITA. There’s also an additional benefit of separate logins that’s even better, but way too sensitive to be public. I’ve read on DansDeals that one of the triggers for an AmEx FR is having too many AUs on your AmEx accounts. A couple people asked him on his blog post about it, how many is too many, but he never responded to that particular question with a number. Do you have any sense of how many is too many? I’ve been using this strategy and now I’m a bit concerned that I may be drawing attention to myself. I definitely don’t want an FR! Any idea if Serve subaccounts work? Haley:Speculation on my part–but the card numbers need to be unique. I’m no longer a Serve holder so I can’t check, but if Serve Subaccount numbers are the same as the parent account then for sure it wouldn’t work. With Unique card numbers you at least have a shot of it working via SYNC. Synced my Serve sub account and loaded all current deals via Twitter. 4 sub accounts per primary! Ordering them one at a time. There is a good sync opportunity other than Lowes/Staples right now. I’ll let people find it themselves, the hunt is part of the fun. Awesome news Haley, thanks for sharing. I’ll be switching over to Serve from BB for at least myself, possibly my wife as well. No real benefit to holding 2X BB when the same $5k that can be loaded at WM can be cashed out there for $3.50 (or less) through other means. Also a good service you may want to check out: http://wandr.me/SyncAssist/ Can auto-sync your cards. Thanks for the great tips but i have a question. If i add some AUs to my account, my grandfather for example, and try to make a purchase to take advantage of the offer using his AU card, what happens when the cashier asks for ID? Eric: You’d be in trouble at that point. However online purchases would be a good alternative. So I can get my wife 2 Au cards by applying using both her maiden and my last name even though its the same SSN? You mention that once you accept an offer on one card, the offer disappears from all other cards under that login. What about the authorized users? I accepted an offer and AFTERWARDS I made a new profile for authorized users, any chance the offer will appear on those? Thanks for the very informative post. In my experience the offer only disappears if someone within the same profile clicks to add the offer. I’ve added offers, then logged into my AU profiles and added them there without issue. I was asking specifically about creating the profile for the additional AFTER the offer has been accepted on the main. Not in the case where the additional already exists. Dan, It should work. A few months ago I mistakenly purchased an item with an AU card that did not have an Amex offer attached. I only realized my mistake because I was looking for the charge as pending on the main account, and it did not show. As what I did dawned on me I hurriedly created a login for the AU card, saw the offer there, and added it to the card before the charge had a chance to go from pending to posted. Once posted the Amex offer automatically hit. One caveat: Some Amex offers are targeted. These targeted offers can show up only on your AU cards, or only on your main card/cards. The Amazon example is a good one: If you’ve ever used your amex card on amazon you probably won’t be targeted for any amex/amazon offer, but AU cards that have never seen an amazon.com charge might. If you’re trying to add a targeted offer it may/may not show on the AU account after you create it. I assume you had already accepted the offer on the main prior, no? Thanks! Yes, thatt’s correct I had added the offer on the main prior to purchase. Here’s an interesting question… if you successfully add your wife as an AU…twice… does that mean Amex reports on her credit report twice as two separate credit lines since the cards are different account numbers? Parkerthon: I had to pull my wife’s CR and check, the accounts only show up once. They probably do report both, but they’re merged since the data is the same. For some REALLY risky behavior, you can add YOURSELF to your own cards as an AU. Add/delete your middle initial. 😉 (Doing so can increase your Amex accounts 2x, and also might cause some real nasty AA). Thanks. I actually did just that before you replied and wondering whether it was a dumb move. What is AA? The AU increase is all I was after. Not looking to tick off Amex. No where in the fine print on adding an AU does it say specifically it has to be a unique cardholder and even if that’s an unspoken rule, they certainly don’t check the SSN. Accidentally I got another card in my wife’s name that matched her existing AU card and somehow that even still went through. Doesn’t seem like they are doing much to stop it. I’ve had my dupes for 1-2 years without issue. While I wouldn’t go opening more you’re just as likely to draw attention in cancelling them as you are in using them, and using them makes you money/miles, while closing them makes you nothing. Question here– I added the Amex Offer for Best buy and Dollar General to two different Amex cards. I am an authorized user on both of these cards. I made the required purchase with my authorized user card that is tied to that account. It has been about 1 week and the credits are not showing up on his acct. Is it because I used my card instead of his? I hope my question isn’t too confusing. Thanks! Kathy: Yes you are correct in the reason why the credit has not shown up. It is tied to the physical card number. That’s good, because it means you can sign multiple cards up for the same offer–but in your case it is bad because you’ve used a card that you did not sign up for the offer. You may be able to call Amex and plead ignorance and ask for a manual adjustment. In the future add offers to both the main and AU cards; either by registering the AU card online or by using either twitter or FB tied to the AU card. Best of luck. Thanks! I have since added my AU cards to my login. Luckily it was on only a couple of charges. I will call and see if they will credit them. Hi I know this is an old post but im now dealing more with cc so it gave me alot more info txs! one question…I have my main cc on amex and then i have a few AU on the same login. When i go to offers I see the offers that I can add to my card but how can i see offers for my AU without having to make them a separate login? Thanks. As far as I know you cannot add offers to au cards on the main csrdholder’s site. You would need a separate logon for them. so when does the separate tabs trick come in handy besides if the cardholder has multiple different amex cards? How do I delink an authorised user ? I have my daughter on my userid however would like to provide her own account id. Sam: Try goign to “Account Services” and then “Card Management” on the left. 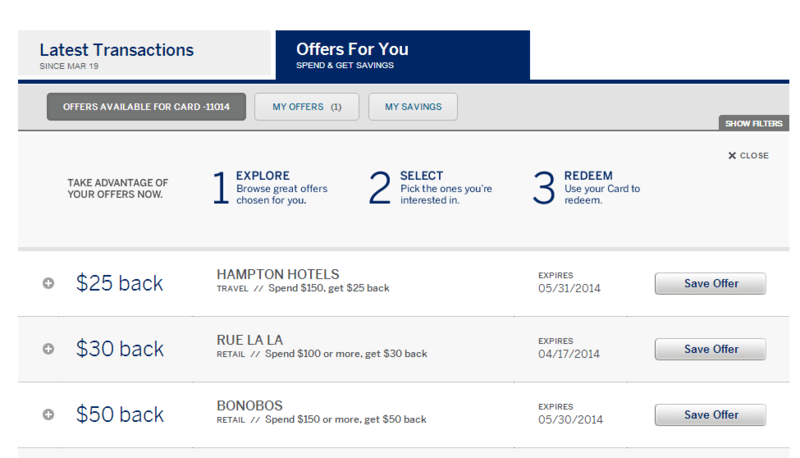 How were those non-loyalty European hotels booked through the Chase Expedia portal?